Mirror, Mirror on the wall, who's the evilest of them all. 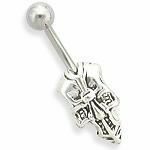 This evil skull navel ring is sure to win the evil contest. It has a stainless steel shaft and evil face reminiscent of a skull as a bottom ball. This will be a bold addition to any ensemble.